Digicel Play’s new local talent show, Yu Em Khax, premiered on TVWAN Life on Saturday 5th November, creating lots of excitement amongst subscribed viewers. While the first episode aired for the first time last week, talented people all across the country still have time to audition for their chance to become PNG’s next household name. Port Moresby auditions showcased a diverse and unique pool of talents, that included a comedian, magician, singer and a wild card, setting the pace for the rest of the performances to follow. Lae will be the next location for budding magicians, singers, dancers and comedians to impress the judges with their performances in each of their respective act categories. Locals in Lae are encouraged to try out for the Yu Em Khax auditions at the Lae International Hotel, on Saturday 12th November at 10am. The judges will have the tough job of selecting talented locals to progress to the heats on Sunday 13th November. From these finalists, three acts will be selected to take part in the live show plus the inclusion of a wild card from the judges. Lae auditions will air on Saturday 19th November, 2016 at 7pm. Yu Em Khax is a new show that is set to create new and exciting opportunities for PNG’s most talented, unique and brightest entertainers. “The first-ever screening of Yu Em Khax was a huge success, with people commenting about the calibre of each act,” said Digicel Play CEO, Nico Meyer. “The premiere show was a hit among viewers. 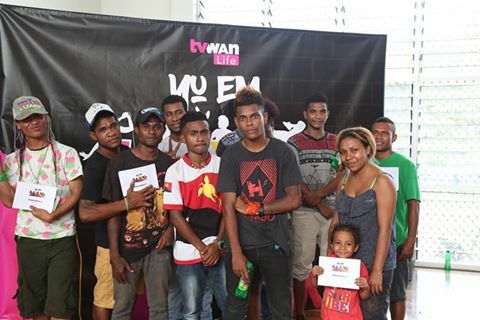 “Our judges will be travelling throughout the country until December 4th in search of PNG’s undiscovered talent. Auditions will also take place in Mt Hagen on November 19th, followed by Kokopo on November 26th and Alotau on December 3rd. Follow the performers through auditions, heats and semi-finals every Saturday at 7pm on TVWAN Life. “To ensure our viewers enjoy the airing of Yu Em Khax this Saturday, we encourage them to make sure their Digicel Play TV plans are up to date ahead of time,” Nico said.